The Yale School of Music is pleased to announce the winners of the 7th–8th grade level of the Yale/New Haven Young Artists Solo Competition. This round of the Competition took place on Tuesday, May 29, at 5 pm in Morse Recital Hall in Sprague Hall. 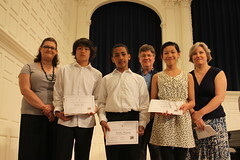 Laura Adam, Education Director of the New Haven Symphony Orchestra, commented that the “poise and confidence of the competing students was very impressive” for their age. The judges for the competition were Laura Adam, Education Director of the New Haven Symphony Orchestra; Thomas C. Duffy, Director of the Yale University Bands; and Wendy Sharp, Professor of violin at the Yale School of Music.